Good luck. We know tests are all about effort and not luck though so study like it really means something to you and you'll get your goal!! My studying has been completely derailed. I'll focus on the December test. Chris - Agreed! Mental workout! Ryan - Sure thing. You taking it this year? Jaydee - Which level are you aiming for? 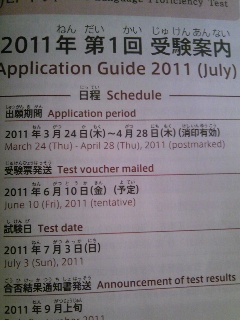 Still two months left to study for the summer test; can get a lot done in that time. Lina - Thanks! Have you taken the JLPT? Good luck. I'm going for the N2, too. Not sure about the reading section though. That's always where my vision goes blurry. What do you think is going to be the toughest section? Haven't even sat for N5. ^^! Mac - I took it in winter and definitely the reading section was hardest for me. Was surprised to find the listening section not too difficult. Oh, I see you have a JLPT website - will be checking that out! Good luck. I don't think I have it in me to sit the N1 this summer. Thanks for dropping a comment, David! It does take a certain amount of energy just to sit for it, you've got that right. And N1 takes a lot more study than N2, from what I've heard. Good luck!! Right no I'd probably pass 3, but not 2. Ganbatte!! Well, keep working at it, Allie! Do you have a goal for the long-term, like level 2 or 1? Or maybe a non-test-related goal? Going for N3, having already passed J3. I'm not very motivated at the moment due to too many things going on. Jay Dee - yeah, I passed the J3 4 or 5 years ago...decided to forgo the N3. Feel like for me it's kind of now or never...will be a lot harder to study and improve once I leave. I sent in my form about two weeks ago but I still haven't received my confirmation letter. Did anyone get theirs? Not yet, but the post mark cutoff is today. They probably won't go out until they have all the the received and approved applications together.